Olu Oguibe, an American artist of Nigerian descent, presented his artwork – a 16-metre Monument for Strangers and Refugees at Königsplatz in Kassel. On September 5 the city plans to acquire the artwork and turn it into a permanent public sculpture, but the place hasn’t been chosen yet. The city’s culture committee had a meeting on August 22 to discuss the Christian Democratic Union of Germany’s initiative of purchasing the artwork by the American-Nigerian artist Olu Oguibe and making it a permanent monument on Königsplatz or in any other place. The CDU’s representative Holger Römer called for the acquisition, but noted he was against the idea of leaving the obelisk on the square. 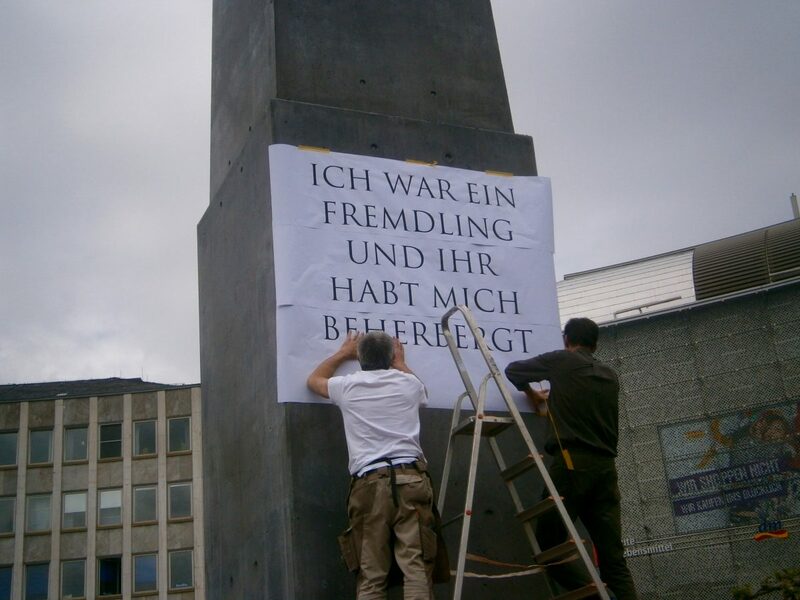 Kassel’s mayor Christian Geselle said there were no legal or technical reasons to argue against the installation of the monument on Königsplatz. German politician Thomas Materner, a member of the xenophobic party Alternative für Deutschland (AfD) and Kassel city councillor, described Olu Oguibe’s work as “ideologically polarizing, deformed art”. Materner’s words are reminiscent of the term “degenerate art” used in Nazi Germany in relation to modern art. The resemblance was noticed Gernot Rönz from The Green, who said there’s little difference between the terms “deformed” and “degenerate” art. Materner added his party would call for public protests right outside the monument “after each terrorist act carried out by a refugee or an immigrant”. Adam Szymczyk, the artistic director of Documenta 14, said he was horrrified by the politician’s remark. A survey by HNA.de involving more than 5000 people showed that 60% support the location of the obelisk on Königsplatz.